Everything I Never Told You is a tale of a Chinese-American family in a time when diversity was constantly frowned upon. Set in the 1970’s, the Lees, a family of five, struggle to understand each other. They also struggled to fit into a world that didn’t understand them. The father, James, is of Chinese heritage, while his wife, Marilyn, is white. Their three children stand out as Chinese-Americans in an all white school. They kept one too many secrets from each other and in the end it cost their middle child, Lydia, her life. Ng uses this novel to explore the pressures with which parents weigh their children down, not even knowing they are doing so. Ng writes, “How had it begun? Like everything: with mothers and fathers. Because of Lydia’s mother and father, because of her mother’s and father’s mothers and fathers” (Ng 25). This novel beautifully captured the terrors secrets can keep and just what happens when the web of lies begins to unravel; slipping like water through your fingers so quickly you never even understood how you could possibly have held it all in. Through a stunning display of multiple point of views, Ng smoothly navigates from one character to the next, letting each story play out until all the secrets the family tried so desperately to keep are brought to light. By switching points of view, the reader can hear the distinctive voice of the mother, the father, Nath, Hannah, and Lydia herself as the reader learns what they never told each other, making the title of the book a clever one. Normally, a common fault with some novels is not holding the reader’s attention. Ng does not make this mistake. The novel captured my attention right from the start and kept me guessing all the way up until the final word had been read. The text itself has a dazzling introductory line when Ng writes, “Lydia is dead. But they do not know this yet” (Ng 1). The mystery of Lydia’s death had me guessing the entire time. How did this happen? Why did this happen? One thing I really enjoyed in this novel was how each character was guilty, because at some point they all lied. One example of Nath’s lies is when he said, “All Nath would know, for sure, was this: he pushed Lydia into the water” (Ng 154). It really captured through the characters and family dynamic how many secrets we keep and how many lies we tell to ourselves. This is a great read for those who have suffered similar pressures of the family dynamic and who want a read that will keep you captured from beginning to end. It was thoroughly enjoyable and will hold its readers captive from the first to last sentence. If you are looking for a quick and enjoyable read that runs your emotions all over like a rollercoaster, then crack open this book and find out just what really happened to Lydia. 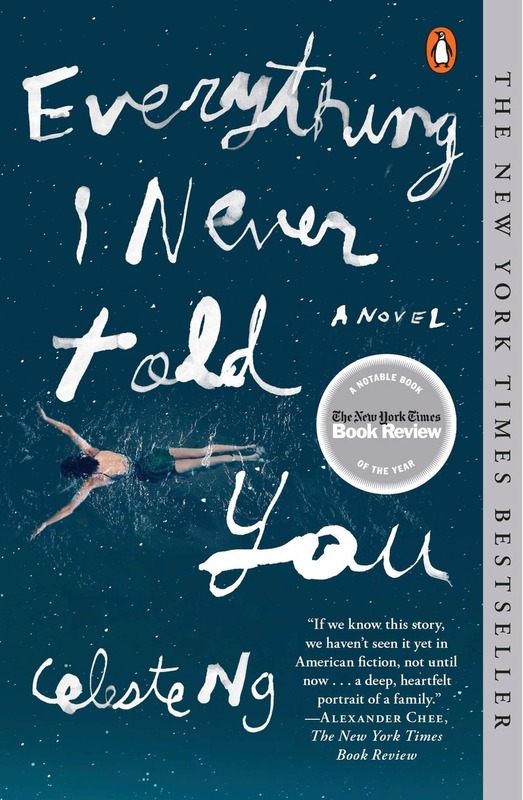 About the Author: Celeste Ng is a writer in Cambridge, Massachusetts (It’s pronounced “-ing.”) Her debut novel, Everything I Never Told You, has won multiple awards and was a New York Times bestseller, Amazon’s #1 Best Book of 2014, and on the Best Book of the Year lists of over a dozen outlets. Her second novel, Little Fires Everywhere, will be published in Fall 2017.